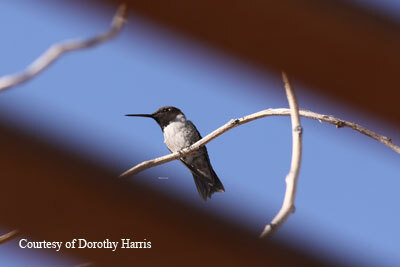 The Black-chinned hummingbird does have a black chin so the name is appropriate. It is also easier to remember than the scientific name Archiloches Alexander. This name was given to honor Dr. Alexandre who first discovered this species in Mexico. On account of its adaptability, this hummingbird is as common in the Western United States and Canada as the Ruby-throated hummingbird is in the East. Sometimes it is confused with the Anna's and the Costa's who all reside in the West. On careful observation we learn that the the Black-chinned can be distinguished from other species not only by physical appearance but also behavior. As a matter of fact you will notice that they are usually subordinate at feeders to the Anna's, Rufous, Violet-crowned and the Blue-throated. On the other hand, they do tend to dominate the Costa's hummingbird. The adult male has a black chin. Its throat is black with a strip of gorgeous iridescent purple at the base. You will be extremely lucky to see this purple because it needs light shining at just the right angle. If you are going to identify this bird, look for the white collar that wraps around onto the sides and neck. For further identification, you can notice that it has long wings and a tail extending just a little beyond the wings. The adult female is small and slender. Its whitish throat (gorget) sometimes has brown spots. The underparts are dull green to a grayish color. It also has long wings that extend just beyond the tail. An immature male can be hard to distinguish from an adult female. Of course, it will be small until full grown. So you might mistake it because of its size. If you can get a closer look at the bird, you will discover a shorter beak than the adult male. If you are really lucky, you might see that the underparts are a slightly reddish color. This will be the case until it molts and gets its adult feathers. An immature female is also difficult to distinguish from the adult female. Again, its beak is shorter and the underparts are slightly reddish color. We enjoy watching the behavior of the young birds. They tend to be friendlier than adults. To us they seem as innocent as children. The Black-chinned hummingbird has the most extensive breeding range of all Western hummingbirds. It breeds form southwest British Columbia to southern California. They prefer lowlands, forests, orchards, small canyons, and urban gardens. Some states dry up in summer. The Black-chinned hummingbirds are clever enough to adapt to this by moving from the lowlands to the mountain slopes in search of nectar. They do have a faint high pitched warble. I am only mentioning this for the sake of scientific accuracy. Don’t expect to hear that soft sound. You are more likely to hear the twitters of these hummingbirds while fighting in territorial battles. If you happen to observe a mating ritual, you might hear a high pitched whiny sound. Like many hummingbirds, the mating ritual is high drama and something to see. The male displays for the female by performing a perilous 60 to 100 foot dive. Watching this ritual can just about take our breath away. I imagine it must get a ladies attention! As with most hummingbirds, only the female builds the nest. Unlike, some other species, this species of hummingbirds do not line their nests with lichens. The nest is mainly built from the plant down of such trees as Willows or Sycamores. You might want to note that the female often builds more than one nest since she will have more than one brood. Sometimes, she builds the second nest while still feeding the brood of the first. Now, I would call that multi-tasking. We found this video of a mother Black-chinned hummingbird feeding her babies.....Hope you enjoy it! Here is another way that this species is different from other hummingbirds. Most species lay 2 eggs per clutch. This species lays 1, 2, or 3 eggs. I wonder about this because it must be a busy mother who lays and cares for 3 eggs while building another nest at the same time. We know that hummingbirds are fast but it sounds as though the Black-chinned could use a nanny. She will incubate the eggs for approximately 13 to 16 days. This dedicated mother bird continues to feed them until they leave the nest as fledglings. How to attract hummingbirds such as the Black-chinned is simple. 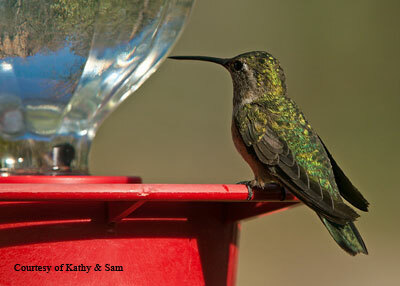 Provide hummingbird feeders with nectar and possibly plant brightly colored flowers with a high nectar count. Good luck.